You only need to walk along the Boulevard Saint-Germain on a sunny afternoon to understand Paris. You’ll promise yourself that you’ll come back – for the rest of your life. Once you’ve seen this city, a piece of you will stay there forever. Just walk and gaze up at the facades of the elegant sandstone buildings of the 19th century Haussmann era, dotted with white wooden shutters. 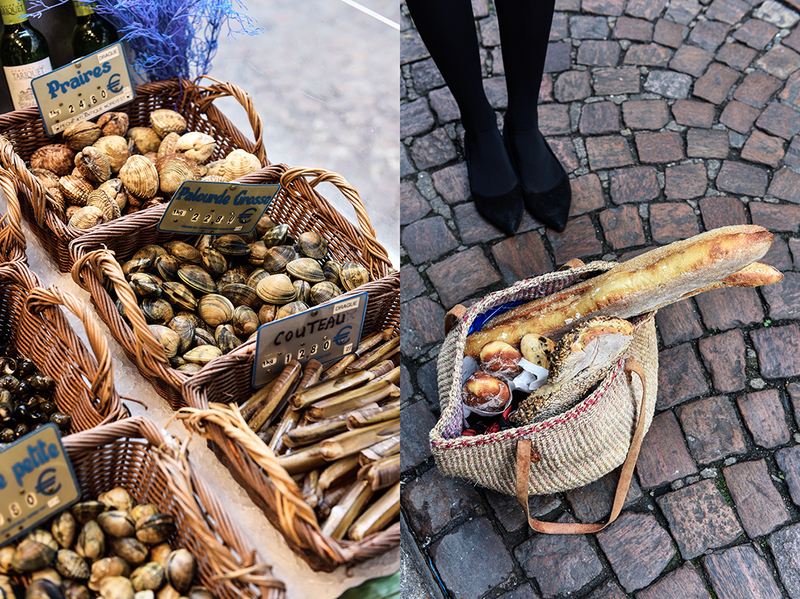 Or sit in a café, get comfy on a colorful French wicker chair at a marbled bistro table, a glass of crisp white wine in front of you, order a Galette, crêpe, or escargot, and look at the chic people around you scurrying on the cobblestones. The trottoir is a stage in Paris, and the bistro is the place to watch it from. We could have just stayed in Paris, visited renowned restaurants and celebrated chefs in their praised kitchens and we would have never had to leave this inspiring city, but when we decided to include France in our culinary trips around the world together with Zwilling, I had to think of the whole picture that the country paints. France, to me, is the trinity of Paris, the countryside, and the sea. It’s the capital’s seductive charm, its haute cuisine, food temples that attract gourmets from all over the world to enjoy the pleasures of French tradition, to create the best food with the most refined techniques and ingredients. It’s a city that rouses and satisfies your appetite, you’ll never get enough of it. 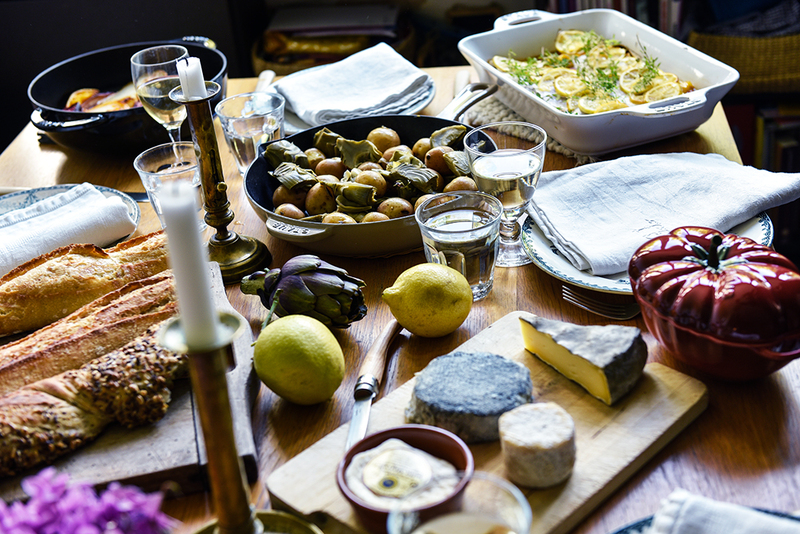 Then there’s the countryside and its more rural cooking, frugal, hearty, and meaty, all those wonderful delicacies coming from the soil and the woods, and also the home of French wine. And which region would be better to learn about the country’s famous wines and winemakers than the picturesque Médoc. There are so many fantastic French reds and whites and there’s a compelling mystique about the vineyards covering the slopes around the city of Bordeaux. To make the trilogy complete, we have to look at the sea. All those oysters and clams, fresh fish and lobster, these treats that are often served raw or so pure that you can still taste their salty freshness. It’s always better to go to the fruits from the sea than letting them come to you, so we packed our bags and went to Cap Ferret. It’s a long peninsula stretching into the rough and cold Bay of Biscay, where the beaches are long and lonely, the people are kind and welcoming, and you can eat the best oysters of your life straight from the banks, all day long. 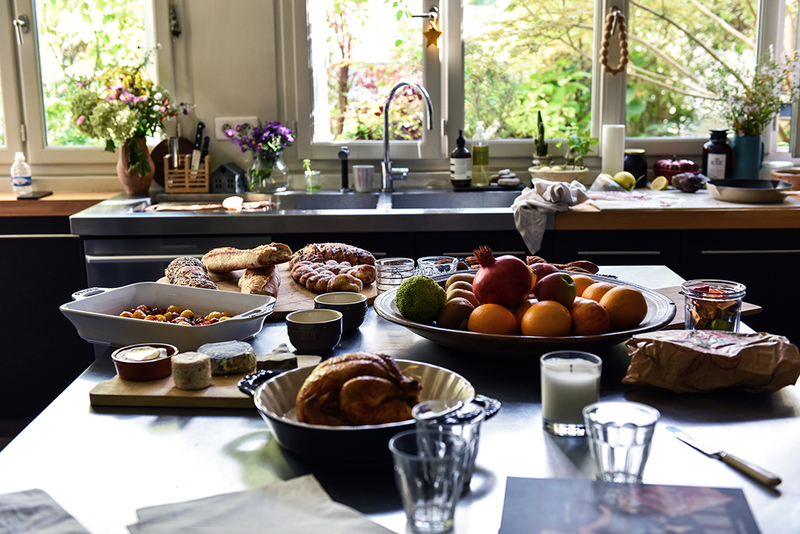 So we started our trip in Paris and Cécile Molinié’s kitchen was the first place we visited for a new series of Meet In Your Kitchen features in France. Four children and a cat called Cookie are enviably lucky to call Cécile Molinié their maman. 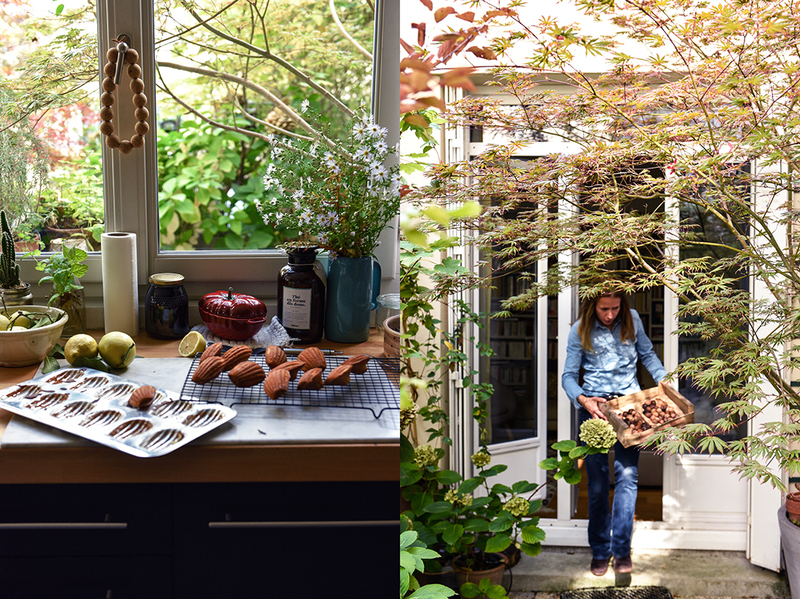 Her Paris kitchen is the cozy heart of the big family’s beautiful home close to the Jardin du Luxembourg, in the capital’s vivid Quartier Latin. The room is bigger than normal city kitchens and opens onto a spacious, green terrace. 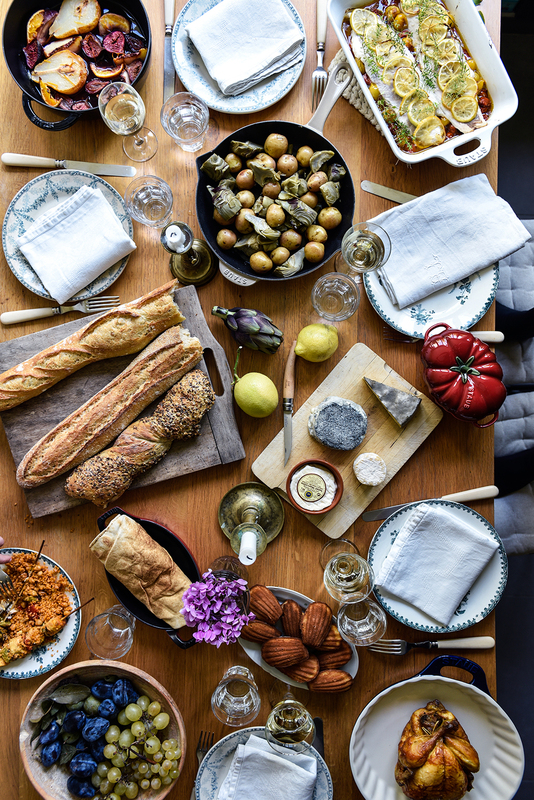 It’s filled with lots of light, life, and laughter, while delicious food spread out on the large island and table is a tempting invitation to come together and indulge in maman‘s creations. 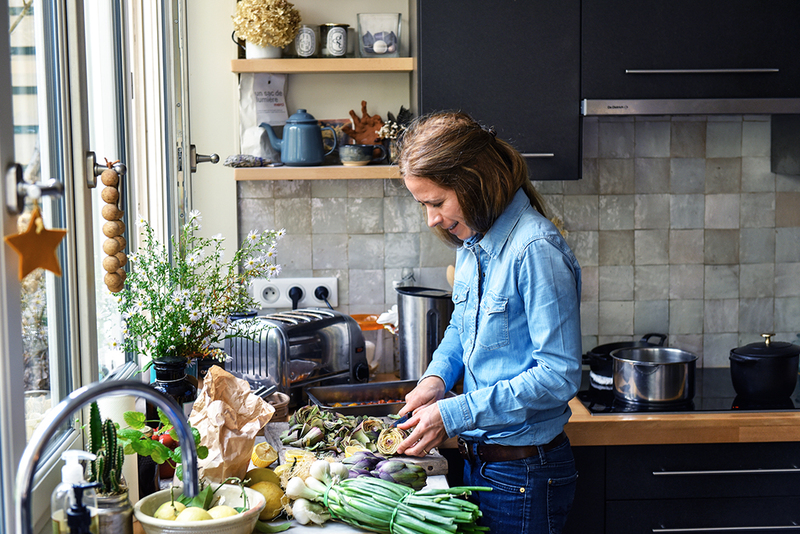 It’s a family kitchen where the six Parisians, Cécile, her husband, and their kids, meet to share their day, to cook together, and turn their daily meals into little feasts. 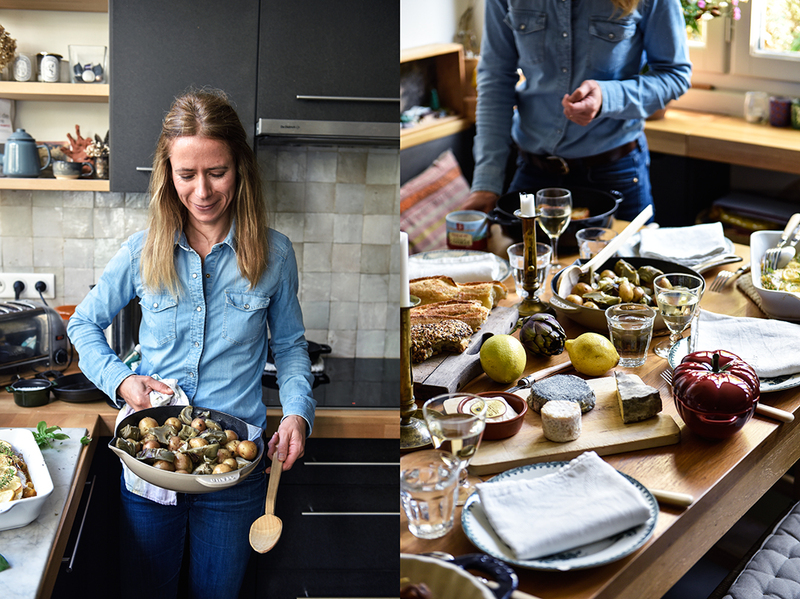 Cécile is an excellent cook, her grandmothers passed their passion on to her and this heritage found fruitful ground in the young woman, she’s been fascinated by the excitements of the culinary world since she was a little girl. 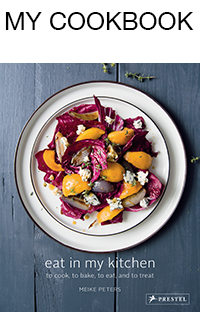 At the age of 16, Cécile already prepared the meals for dinner parties of 20 guests at her parents’ home. The house was always open to friends, her mother loved to entertain, but didn’t feel inspired by the kitchen herself. So Cécile gladly took over those duties and became more and more skilled as a cook, she refined her taste and became impressively precise through experience and practice. Tender Boeuf Bourguignon, Blanquette de Veau, or petite Madeleines are staples in her repertoire, she loves the famous French classics and curiously dives into the country’s different regional cuisines. 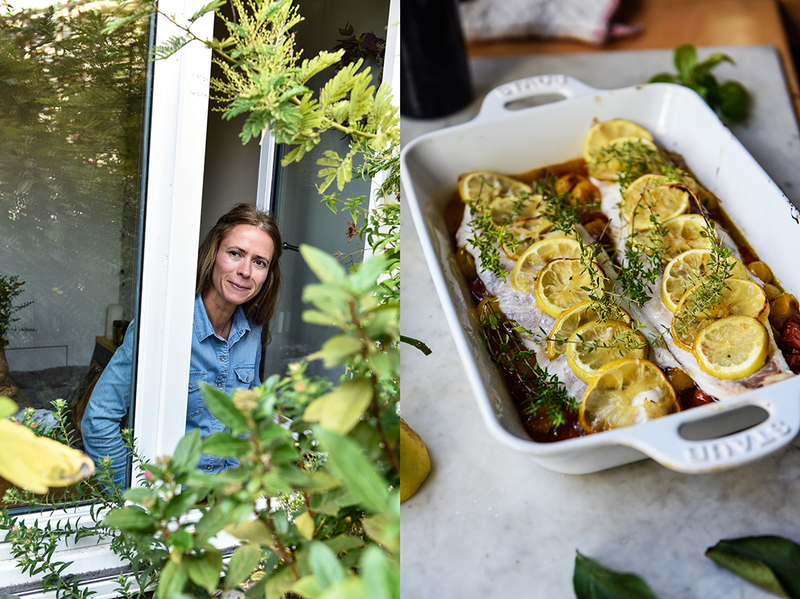 Southern France inspired her to create a recipe for sea bass bedded on sugary-sweet roasted tomatoes. She finishes off the summery composition with lemon slices grilled in the oven until the edges are crisp and golden, it’s a colorful firework of flavors and textures. How could I disagree when she offered to cook this dish together with me in her kitchen? I’ve been waiting impatiently for the day to come to finally meet her, in the kitchen that I knew from her famous Instagram account where she shares visual bites from her life. The pictures are stunning, she’s just as talented behind the camera as she is at the cooker. You can feel her love for her city, so much so that you want to stroll along the Seine, the bistros and boulevards together with her. When she visits her second home just outside Paris and posts episodes from her country life, you seriously wish you could move in with the whole family. 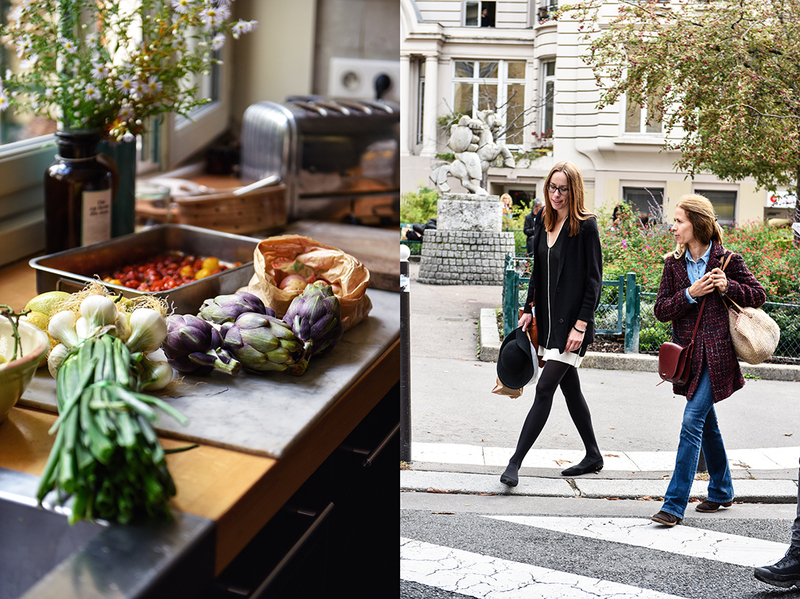 So we finally met in Paris, but before we pulled the pots and pans out of the cupboards in her kitchen to cook, we went to the beautiful market on Rue Mouffetard in the 5ème arrondissement. 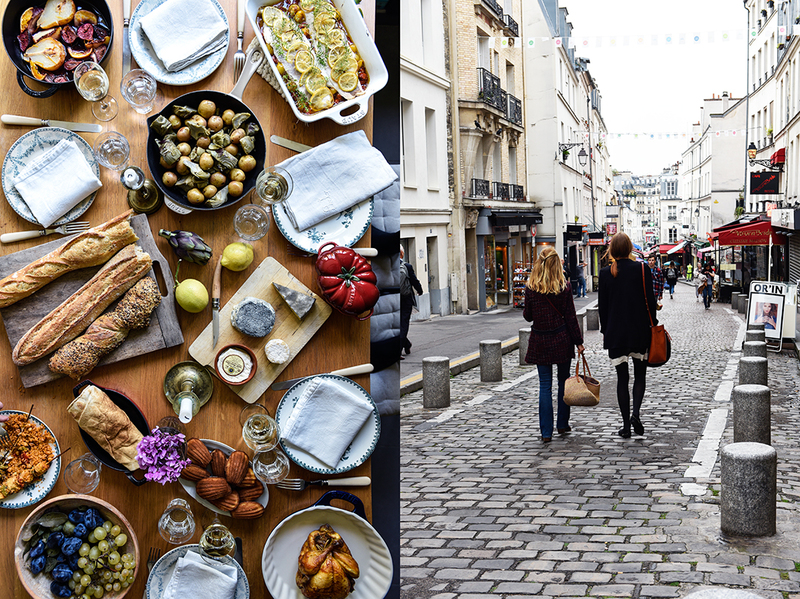 The shops and stalls of the daily farmers’ market gathered on this street make you want to pack your bags and make Paris your home. 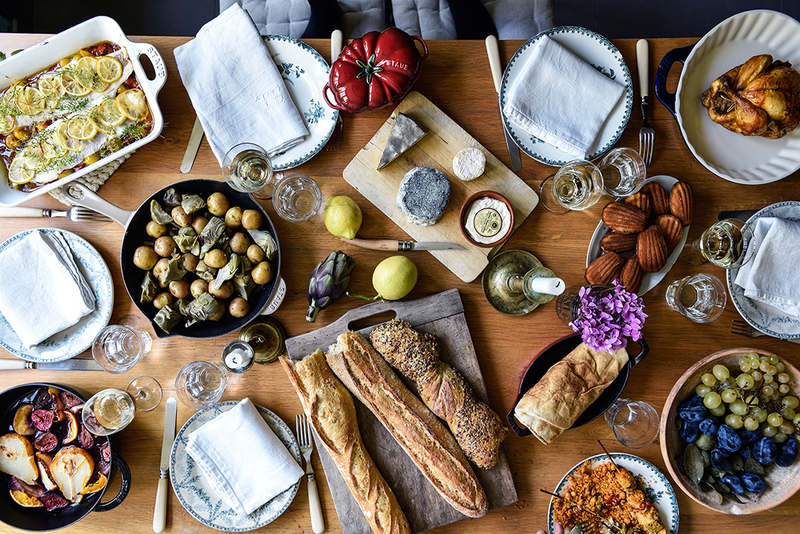 We filled our shopping baskets with wonderfully milky Sainte-Maure de Touraine, ripe Saint-Nectaire from Auvergne, and the creamiest Saint–Marcellin from Fromagerie Véron. The beauty of the presentation at the fishmonger took my breath away. Quality and freshness are unbeatable, wherever you look. Gills and eyes clear and shiny, crabs are still alive, bulots (sea snails) freshly cooked, and the oysters in the wooden baskets taste salty-cold like the sea. 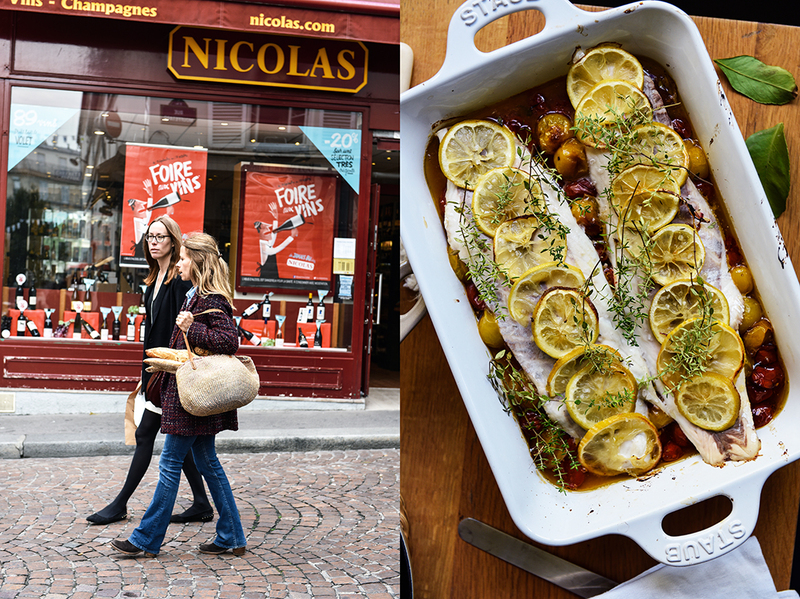 Cécile’s butcher is right next door, you can smell the golden poulet rôti rotating on metal skewers all along the cobblestone street, their hot juices dripping onto the potato wedges perfectly placed at the bottom of the grill. Packed with warm baguettes from the boulangerie under our arms, the baskets overflowing with all these delicacies, we went back to Cécile’s kitchen and started cooking. Preheat the oven 170°C / 350°F. Spread the cherry tomatoes in a large baking dish, add a splash of olive oil, salt, and pepper, mix, and roast for 1 hour or until soft and candied. While the tomatoes are in the oven, spread the lemon slices in a large baking dish, drizzle with 1 tablespoon of olive oil, and bake them, with the tomatoes, for 30 minutes or until they soften. For the side dish, bring a large pot of salted water to a boil, add the juice of 1 lemon and the artichokes, and cook for 15-20 minutes or until tender. Drain, rinse quickly with cold water, and set aside. Cook the potatoes in a medium pot of salted water for about 15-20 minutes or until almost soft; drain and set aside. 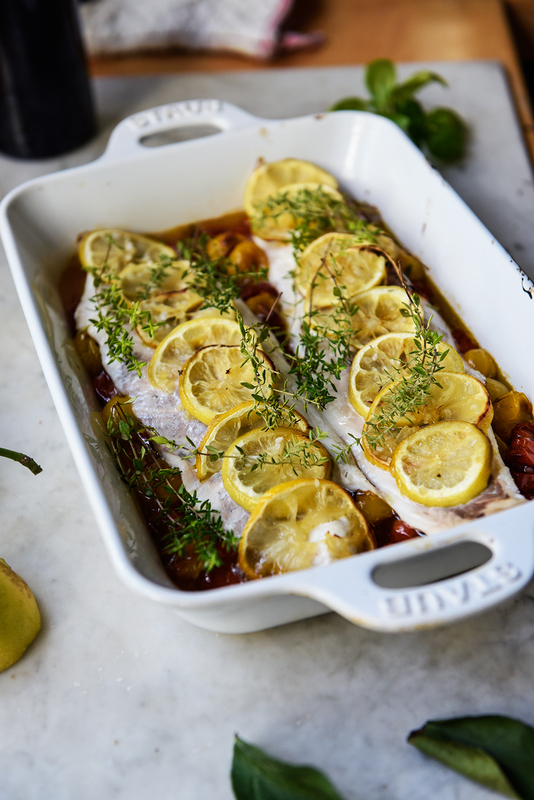 When the tomatoes are done, arrange the sea bass on top of them, season with salt and pepper, and cover with the roasted lemon slices. Roast for about 10-15 minutes or until the fish fillets are done, you should be able to flake the fish with a fork. Mind that you don’t overcook it. Sprinkle with the thyme. While the fish is in the oven, heat a splash of olive oil in a large heavy pan and sauté the potatoes and artichokes over medium heat, stirring once in a while, for about 15 minutes or until golden and crispy. Season with salt and pepper to taste and serve immediately when the fish is done. I came here because of university. My younger sister was admitted to a very good post-baccalaureate school, Henri IV, here in this neighbourhood. As I was the eldest one and I was good with managing a home and cooking, my mother wanted us to go together. So I was admitted to the prestigious law school here, and then…I never left! Did you fall in love with the city immediately? So, you didn’t have an easy start? Were you always interested in photography? Yes, yes. I remember that when I was a child, I won a little camera because I did a drawing contest, and then when I was 16, my dad gave my sister and I a nice Canon camera – I remember! An old one, you know an analogique (analog). I love to cook. My mother is more an intellectual woman than a…. Yes! So, I had an interest in cooking – I don’t know why – and I took over the kitchen at a very young age. She let me do whatever I wanted so I tried new recipes, I made notebooks, and as my parents had lots of friends coming from all over the world – they were very welcoming – I used to cook a lot! So you cooked for the family and for friends! For how many people? I don’t know! But when I was 16, I could cook big meals and it was great because you have some meals where you need to be in the kitchen and do things at the last moment, so my mother was with the friends and I was cooking! What’s your favourite dish cooked by your grandmother or one of your grandmothers? My father’s mother used to make a very good blanquette de veau, a very good one. My mother’s mother, she’s from the southwest of France, so it’s more about zucchini, eggplants, and tomatoes, more Mediterranean – and she cooks very well, too. In my husband’s family, it’s not as we call in France plats en sauce, you know all these stews. It’s more about very good produce, cooked well. Does your husband love to cook too? He cooks rarely, but when he does it’s a very elaborate meal. We are great fans of Alain Passard, the chef of the Arpège. I used to be invited to his restaurant when I was a student by a friend. We go there for very special occasions, so my husband has his book and sometimes he cooks from this book. He cooks very creatively and elaborately, but not that often. So, he’s more the weekend chef? I would say, once a year! So, once a year he’s the weekend chef but then he’s fantastic! Where do you find your inspiration for your recipes? At the market first because you see the food and you think “ah, I want to do that or this” and then cookbooks. 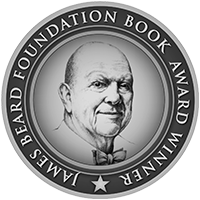 I think I love cookbooks! I love to read them, I like to see the pictures, but I’m not good at following the recipes exactly. …a great inspiration. I still have one from when I was a very young woman and I still look at it, because the recipes are all good. Really, the inspiration comes from the market or from other people. At the market this morning, I spoke to a guy who was telling me what he was going to cook for his parents for lunch – you take ideas from everywhere! And some blogs too, but you need to have time to read them – sometimes it’s easier to have a book. 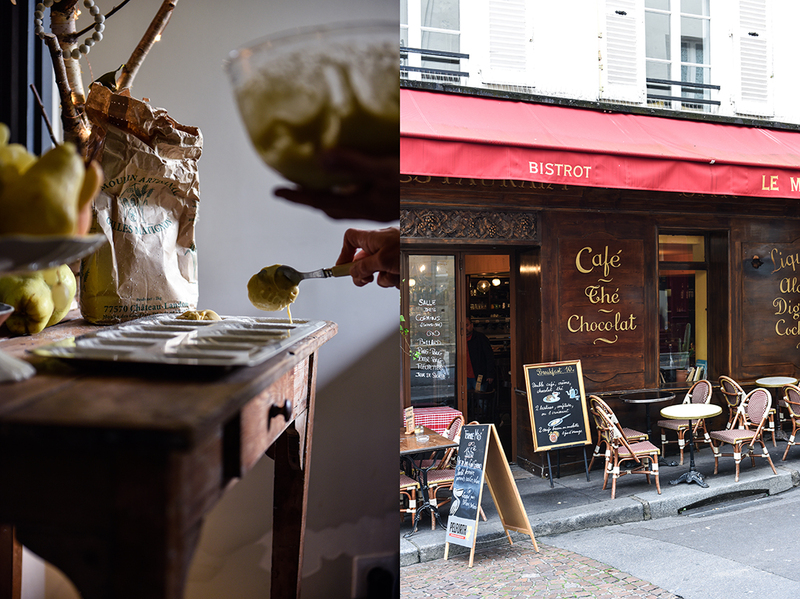 Do you prefer to cook when you’re here in Paris or in the countryside? In the countryside, it’s usually the weekend so we have more time. And maybe you think I’m picky but I prefer to cook with gas rather than with induction. Healthy means first of all cooked with good produce. I want my kids to have veggies and fruits every day. They are picky eaters, I must confess! I try to have them eat fresh fruit and veggies – it can be compote, it can be soups, it can be raw – healthy, for me, is when you have all the nutrients that you need in the food.And homemade, mostly homemade. I rarely buy frozen food. Some frozen pizzas just for when I have no other plan, but I prefer to cook eggs and potatoes instead. When I bake cakes, I use the baking paper. In France, it’s not that automatic to do that. So, you can’t live without baking paper? No! And then I always have some veggies to roast. You know, I am very organized, so sometimes I start to cook in the morning – even at 7am, when the kids are just waking up. I always roast some cherry tomatoes, zucchini… And when it’s winter, pumpkin – that kind of thing. I always like to have something roasted. So being organized in the kitchen is one of your greatest tips? Yes, when you work and you have a lot of kids, who often come for lunch and dinner. And bread. I’m sorry, but we eat a lot of bread! I always have some bread! And butter! And cheese! You’re going to have 10 friends for a spontaneous dinner, what will be on the table? It’s going to be pasta – I’m sorry! – because we always have pasta and fresh Parmesan. We often have ham. In French we call that – you know the proscuittto crudo? The big ones that you can slice yourself – so I often have that. I could do pasta with fresh tomatoes and basil – I always have basil – so all good produce but very simple. And a good bottle of wine! That’s something that I would do if I had an impromptu meal with lots of people. Everybody is happy with that kind of food. And then fresh fruits or cooked fruit that’s easy to do. I love Alain Passard’s food. So if he could come cook for me, a delicious vegetable dish, I would like it! I like light food. If you could choose between improvised and planned dinners, what would you prefer? I like to plan because I know I’m happy to plan something. It makes me happy to anticipate the people’s happiness. But sometimes, it’s stressful to plan something. You want to have a good result. I am a perfectionist, so sometimes when you plan ahead and you want people to be happy, I’m often disappointed by the result. When it’s impromptu, you don’t have much time to think about it and it’s more about the pleasure to be together. You know, I think as much as I like to plan a meal and to share it with friends, when I do something that’s not planned it is super good, too. So I don’t know what I prefer! I prefer everybody to be happy around the table and laughing. If the food matters too much then sometimes you lose something in the pleasure of being together. I like when my kids give me a hand, and I like to cook with friends, because it’s something to share, but I am faster by myself! Thank you very much, Cécile! So good to see these photos and remember those fantastic moments together! Thank you so, so much Cécile for sharing your Paris with! It was such a precious time! Thank you Meike for a beautiful post!